Energyfab Manufacturing has repair facilities to provideÂ complete repair services Your equipment investment consists of equipment that requires pro active and regular maintenance. An inefficient system will not perform to its optimum potential, incur more costs and will cause production interruptions. 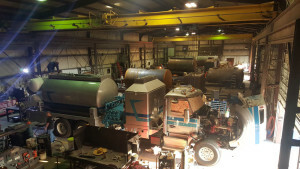 Here at Energyfab we provide a wide range of services from the fabrication of hard to locate parts to complete rebuilds along with general maintenance and servicing. Our main priority is service and customer satisfaction. There’s always someone at the end of the phone ready to answer any questions you may have or to arrange a visit. Contact us today!